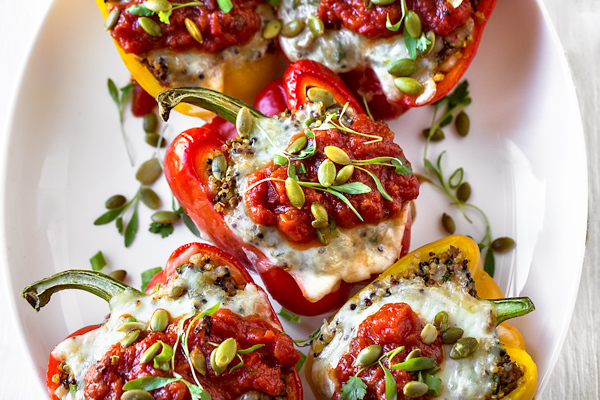 Tender and deliciously seasoned, these stuffed peppers are filled with quinoa, lean ground beef, sun-dried tomatoes, pumpkin seeds and a sprinkle of cheese. They’re a scrumptious and healthy meal any day of the week! As a kid, my mom would prepare her recipe for stuffed peppers quite often. Back then, I wasn’t such a fan of peppers, so this wasn’t necessarily my favorite meal, truth be told. But as I grew older, and slowly learned to appreciate foods with more flavor and depth, I grew to really enjoy stuffed peppers as a warming, rustic meal. 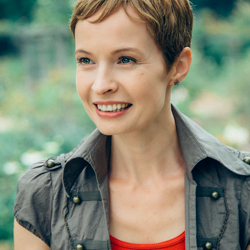 I became enthusiastic about food and cooking in my late twenties, and that’s when I decided to become a personal chef. 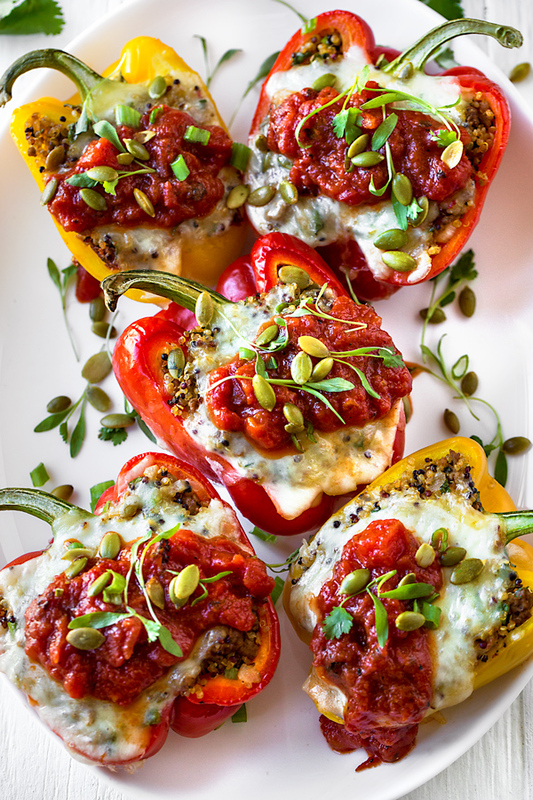 Over the years I’ve cooked for many different clients (many who leaned towards healthy meals), and so I developed my own stuffed peppers recipe to whip up and serve. Inspired by my mom’s recipe (I liked the juiciness of her peppers because she cooked them in a tomato-y broth), I experimented with various filling ingredients and different kinds of peppers. I even found my own method for how to cut and fill the peppers before roasting. And voila, a stuffed pepper recipe that I like to call my own was born! I like to stuff my peppers with loads of flavor, a bit of a kick, and lots of love! And I have a feeling it’ll become a recipe you’ll enjoy preparing in your own kitchen as well! 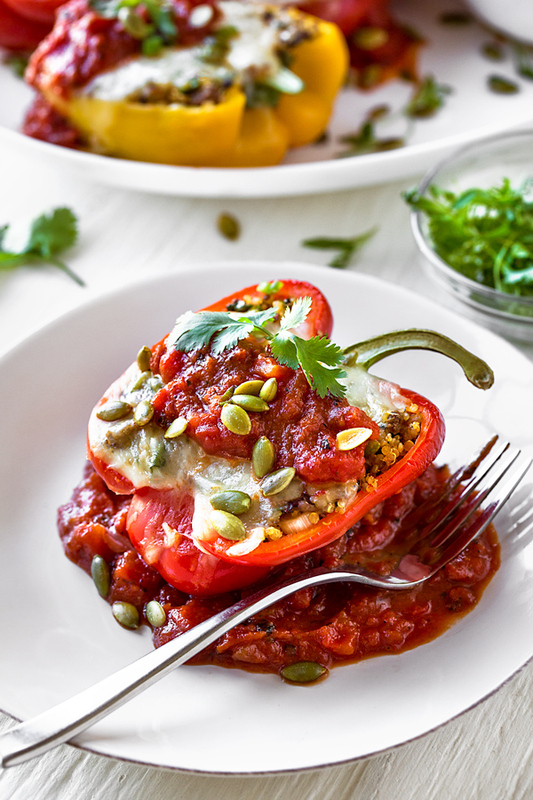 For me, I like a lot of texture as well as seasoning when it comes to stuffed peppers, and I also like to give them a bit of a healthy slant by using filling and nutritious ingredients. For starters, my “vessels” of choice are bell peppers, preferably the sweeter red and/or yellow ones. I actually really love to use a combination of both for extra color! While I have used rice in my recipe in the past (this is a great option, of course), these days I really like to use quinoa. And because I like to add some protein to my filling, I opt for a touch of lean ground beef, but ground turkey or chicken (or even sausage or chorizo) is tasty as well. Where I like to have a little fun is with my spices! Since I appreciate a bit of a kick from south-of-the-border flavors, my choice of seasoning is ground cumin, smoked paprika, a hint of coriander and a pinch of cayenne. For a bit of extra texture, color and flavor, I add in a sprinkle of julienned sun-dried tomatoes, pepitas (pumpkin seeds), cilantro and green onion. I finish things off with a combination of pepper jack and mozzarella cheese, and spoon over a simple fire-roasted tomato sauce. 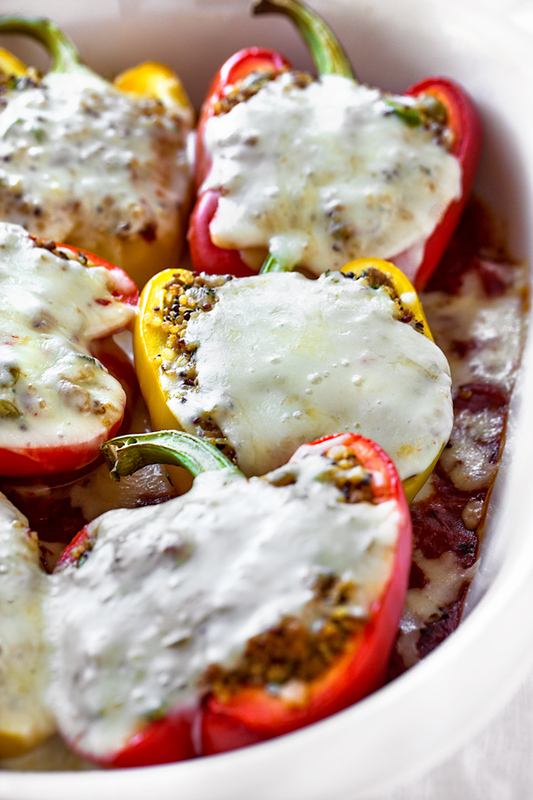 Let me tell you, these stuffed bell peppers are so zesty and delicious! 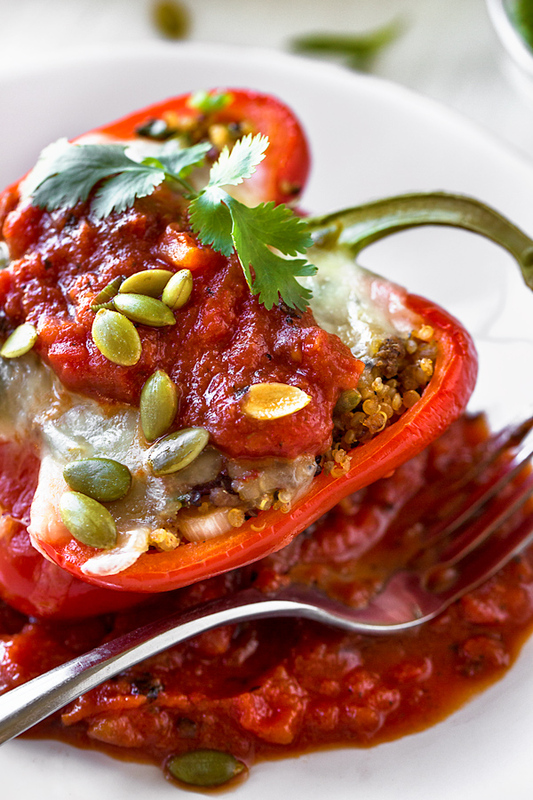 Having all of your components ready when preparing a stuffed peppers recipe makes the process so much easier. I like to have my ground beef and quinoa cooked and ready to go. I also chop up my herbs, and have my seasonings and other ingredients on hand. That way, all that’s left is to stuff and bake. As for the peppers, I personally like to halve them length-wise through the middle (removing the core, seeds and membrane), rather that cut the top off and fill the whole pepper. That way, the stuffed peppers lay flat on a platter when served, and I’ve found them easier to cut through and eat! I begin by preparing my fire-roasted tomato sauce, and set that aside. Next, I mix together all my filling ingredients. Then, I cut and prepare my peppers, and fill them with the filling; I add half of my tomato sauce to the bottom of a medium-large baking dish, nestle my peppers into the dish, and cover it all with foil. Once the peppers are tender, I remove the foil, top them with cheese and place them back into the oven for a moment, uncovered, for the cheese to melt. To serve, I place the stuffed peppers on a platter, spoon over the rest of the sauce, and garnish with extra cilantro and pepitas (pumpkin seeds)! Variety of peppers: I find that red and yellow bell peppers are not only wonderfully colorful, but easier to digest than the green peppers, so I like to use those. I also like their added sweetness! But feel free to use your own favorite kind of pepper. How to slice the peppers: While you can simply cut the stem top off the pepper, scoop out the core and fill it that way, I like to cut my bell peppers in half length-wise, scoop out the core/seeds/membrane, and lay them flat in a baking dish. I find the stuffed bell peppers are a little easier to serve this way. 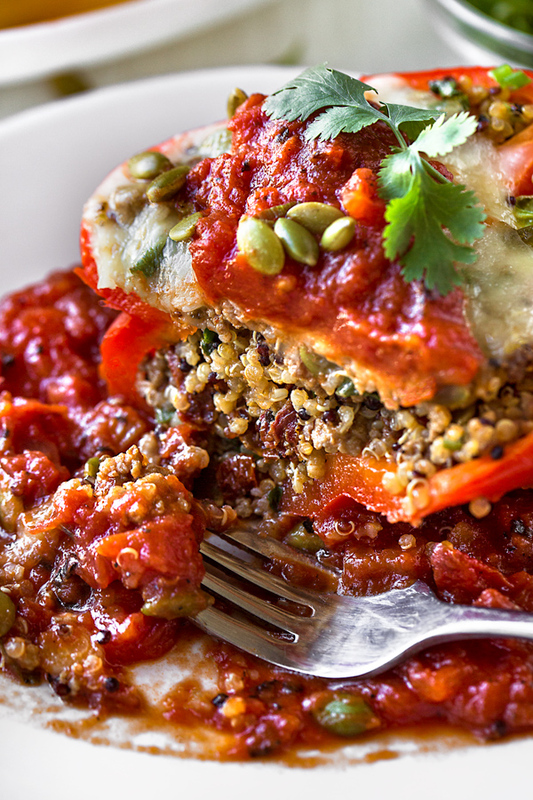 Quinoa for filling: Quinoa has lots of amino acids, and takes on the flavors from the filling really well. However, you can certainly substitute rice (white or brown), or even couscous—the choice is yours. Lean protein: A bit of added protein gives a touch of extra flavor, and I opt for lean ground beef in this recipe. Other great picks are ground chicken, turkey, sausage, or even chorizo! The cheese: Pepper jack has a little hint of spicy-ness, which is nice with this recipe, and the mozzarella is creamier. You can use only one of those two, or even use your own favorite kind of cheese, if you prefer. 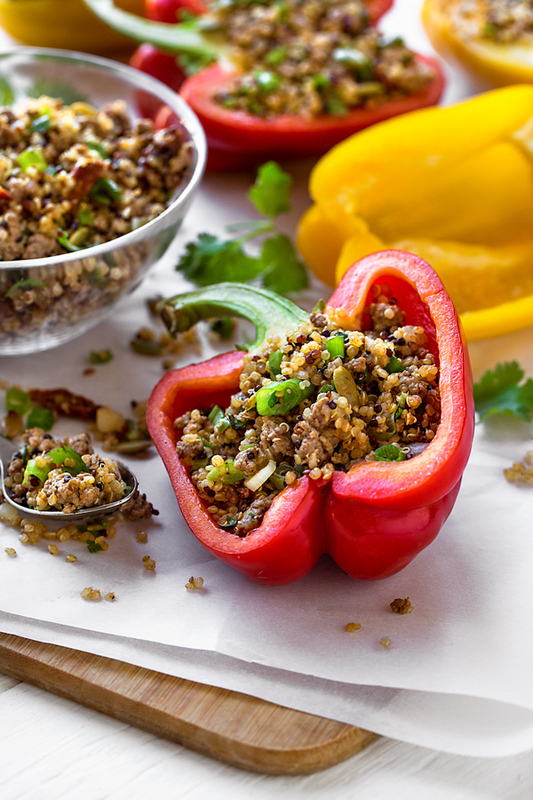 These zesty stuffed peppers are filled with quinoa, lean ground beef, and lots of spices—they’re what healthy, flavorful comfort food is all about! -Preheat the oven to 350°. -Prepare your fire-roasted tomato sauce: To a small pot set over medium heat, add the olive oil and the garlic; once the garlic is aromatic, add in the diced, fire-roasted tomatoes, a couple of pinches of salt and pepper to taste, and stir to combine; simmer the sauce on low for about 10 minutes; set aside and keep warm. -To prepare the filling and stuff the peppers, place a saute pan over medium-high heat, and drizzle in about 1 tablespoon of the olive oil; add in the minced onion and saute for several minutes until the onion is soft and translucent. -Add the ground beef to the pan, and using your spatula or a wooden spoon, break up the ground beef into a fine crumble; add a pinch or two of salt and pepper, and cook the beef until browned; then, add the garlic and stir to incorporate until aromatic; remove beef mixture from pan and add to a large bowl. -To that same bowl add the cooked quinoa, the cumin, smoked paprika, coriander, cayenne, sun-dried tomato, 1/4 cup pumpkin seeds, green onions and 1/4 cup cilantro leaves, and mix to combine (check to see if any additional salt/pepper is needed). -Prepare your baking dish by spooning roughly half of the tomato sauce into the bottom of the dish. -Fill the peppers by spooning a generous amount of the filling into the cavity of each halved pepper, and place the peppers into the baking dish. -Cover the baking dish with foil and bake the stuffed peppers for about 40-45 minutes, or until tender; then, uncover, top with cheeses, and bake 10 minutes longer to melt the cheese. -To finish, place the peppers onto a platter, spoon over some of the remaining tomato sauce, and garnish with extra cilantro leaves and pepitas (pumpkin seeds). 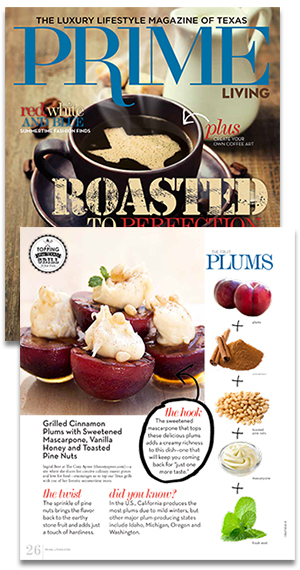 Hungry for other “stuffed” recipes? Check out this recipe for Stuffed Eggplant, these Stuffed Mushrooms, or this Stuffed Acorn Squash! You have created a beautiful masterpiece and a healthy one to boot! Picasso would have been proud of this dish! These were amazing. We fire roasted our tomatoes on the grill (with some apple chips for smoke) and added Anaheim roasted peppers to the tomatoes. Thanks for the recipe. Lori, that sounds so mouthwatering.